Profundity need not imply in-your-face complexity, though in the case of a Bach we need not be surprised to learn that the cantankerous old man who had been employed since the mid-1660s by the town of Eisenach to play and look after the church organ, and by its Duke to play the harpsichord at his newly-established court, a man in his fifties when the ten-year old Sebastian, newly orphaned, left Eisenach to live with his brother twenty-five miles away, that this ‘great and expressive composer’ was reputed never to play ‘in fewer than five real parts’. Carl Philipp Emanuel, who relays the information, must have had it from his father. The adding of parts (layers of melody) to an existing line, to build up texture and define the contours of harmony, is the basis of the polyphonic tradition in Western music, and ideally the ‘whole’ thus created should be greater than the sum of the parts themselves—not only the logic and beauty of the individual lines but the relationships between them have to be heard and considered. The ability to improvise in five real parts, if that is what Emanuel Bach meant by ‘play’, is a very rare skill indeed, only to be acquired with immense diligence. In the apparent simplicity of the two death-arias Mit Weinen hebt sich’s an and Es ist nun aus mit meinem Leben there are subliminal complexities at work—hidden art. Broadly speaking they are complexities of metre in one and harmonisation in the other. Mit Weinen hebt sich’s an could be said to deliver a masterclass in metrical word-setting, achieved by careful choices about which phrases from the text to repeat, and whether to allow the music to pause at the phrase-end or to run on into the next. There is also the deliberate blurring and shifting (by harmonic stasis and the use of silences) of the obvious pivot-point in the rhyme-scheme of this gloomy poem in three stanzas, which chart the miseries of extreme youth, middle age and old age respectively. By the choices he makes, Bach (we must call him that) manages to spread the statement of the opening line across thirteen units of time (or tactus), and by the end of each stanza, by piling on the elisions as the melody rises intensely against a sinking bass, he has somehow brought the listener to an unquestioning acceptance of (eccentric) quintuple rhythm. Es ist nun aus mit meinem Leben, on the other hand, seems simplicity itself: absolute regularity of phrase-lengths, short and sweet melodic phrases often returned to and re-used, though with no repetitions of text (except for the final valediction: ‘Welt, gute Nacht’), and yet each time he repeats a melody line with new words Bach contrives to send it elsewhere harmonically, and in the final repetition of ‘world, good night!’ he uses the simple device of an interrupted cadence under the first ‘good night’, robbing it of its proper finality and, as it were, forcing the repetition (‘Good night, ladies. Good night, sweet ladies’, comes close in terms of subtlety). In both arias the beguiling perfection of the route Bach has planned from opening chord to closing cadence makes the listener yearn to make the journey again—an ideal achievement in the setting of strophic verse (the complete text of ‘Es ist nun aus’ comprises seven stanzas). The alto lament Ach, dass ich Wassers gnug hätte was included, along with these two arias, in the Altbachisches Archiv, the collection of works by his predecessors-within-the-clan passed down to Emanuel Bach by his father. This collection was very nearly a victim of the Second World War (though an edition of sorts had been published in 1935 to mark the 250th anniversary of Sebastian’s birth) but was fortunately rediscovered in Kiev in 1999 and has now been returned to Berlin. Ach, dass ich Wassers gnug hätte has a companion in the bass lament Wie bist du denn, o Gott. Both bear the title Lamento, both are for solo voice, both involve a solo violin, intensely expressive in support of the alto, impressively virtuosic against the bass. Both make use of the rich sonority of a supporting group of violen, marked optional (in one source) in the alto lament but clearly essential in the one for bass. Both are based on Biblical texts: Jeremiah, Psalm 38 and Lamentations for the alto, a metrical paraphrase of passages from the Penitential Psalms for the bass. 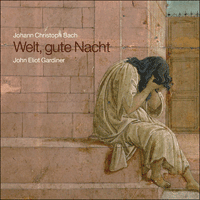 Both have been previously ascribed to other composers: Heinrich Bach (Johann Christoph’s father) in the case of Ach, dass ich Wassers g’nug hätte, Johann Philipp Krieger for Wie bist du denn, o Gott, but both have been convincingly welcomed back to the canon of J C Bach’s works by modern scholarship. It would be futile to offer here any analysis of the alto lament; it is anyway one of the works by Johann Christoph which has received extensive performance in modern times. It is concentrated and concise, and its effect is visceral and, once heard, hard to forget. Wie bist du denn is a more wide-ranging piece in many ways. For a start there is the fiery (stylus phantasticus) virtuosity of the violin writing, then an immense vocal range (more than two octaves) for the singer—the extremes are reached at ‘die Augen werden Blut und schwellen auf von Weinen’ (eye-wateringly high) and ‘so muss ich tief hinab fast in den Abgrund gehen’ (full fathom five). But the vocal writing also demands agility and finesse in melismas, and above all lyricism in the final outpouring that follows ‘vielleicht ist dir gedient mit Seufzern?’ and precedes a return to the ideas and melodic gestures of the opening bars (themselves prefigured in the introductory sinfonia). For all its free-ranging invention in the detail there is an impressive structure to the work: fourteen rhyming couplets are to be set and the first seven are all allotted more or less eight bars of music each, mostly with clear changes of texture and motifs. From couplet 8, however, where the singer speaks of stretching out his hands, each verse-unit is extended over roughly twice as much music as before and the emotional gulf between the singer’s supplication and the violin’s scornful self-preoccupation increases audibly. In counterpoint to this expanding rhetorical trajectory there are a series of structural cadences which always mark a return to the home key, until the last of them where the violin, in answer to the entreaty ‘was forderst du für Gaben?’ (‘What do you ask as tribute?’), wrenches the music into its own idea of a home key with a triumphant four-part chord. From this point to the final bars all the gestures of the accompanying instruments, including the violin, seem bent on consoling the singer’s ‘Herzensangst’ (‘heart’s anguish’), and at the conclusion the voice’s falling sixths are answered by rising sixths from the violin, suspended, not above the expected home key, but its dominant—‘wrath’ modulated into ‘loving-kindness’? Of the two motets featured here, Der Gerechte, ob er gleich zu zeitlich stirbt is preserved in the family archive while Fürchte dich nicht has survived by another path. Both are for five voices (SATTB), with a difference in the case of Fürchte dich nicht. Motets were often written for and sung at burial services and Der Gerechte sets words which offer mourners, in the case of an untimely death, both consolation and the bracing reassurance that the deceased cannot now be misled or troubled by the falseness and wickedness of life. Bach preaches the mini-sermon in madrigalian fashion, varying the musical material throughout to highlight and underline the crucial concepts, and delivering a punchline in the final threefold repetition of ‘bösen’. Fürchte dich nicht begins as a setting for four voices (ATTB) of Isaiah 43: 1, ‘Fear not: for I have redeemed thee, I have called thee by thy name; thou art mine’, and by the thirty-fourth bar the text has been expressed fully and effectively, though the music has found its way from A minor down to G major in the process. Bach simply repeats his setting of the last three words, ‘du bist mein’, up a tone, heightening the expressiveness of the ninth chords, which now become minor ninths. But as the cadence in the home key is reached something quite breathtaking happens. There is a fifth (soprano) voice in waiting and somebody (Bach himself?) has realised that the opening line of the sixth verse of O Traurigkeit, a funeral chorale by Johann Rist which runs ‘O Jesu, du mein Hilf und Ruh’, contains within it the two key words from Isaiah’s simple statement—‘du [bist] mein’. Bach partly deconstructs the chorale tune and its words, lending them a heart-stoppingly halting and uncertain character. The four ‘motet’ singers meanwhile revisit the opening of the Isaiah text until Bach is ready to introduce the simple plea ‘hilf’ (‘help me’) at the beginning of the third line of the chorale. The other singers find an answer in the words of Jesus to the second of the thieves crucified with him: ‘Verily I say unto thee, today shalt thou be with me in paradise’ (Luke 23: 43). Isaiah’s simple monosyllables are brought back as a refrain, and as a coda sealing this promise. Fürchte dich nicht already exhibits some of the techniques, both textual and compositional, of the Lutheran tradition of musical ‘dialogues’, while remain ing essentially a funeral motet. Herr, wende dich und sei mir gnädig and Meine Freundin, du bist schön (this last also from the Bach archive) both bear the official title Dialogus in the sources, and both make the quasi-dramatic nature of dialogues more explicit. Both are scored for a full string band as well as SATB soloists, with virtuoso writing for two violins in the former and for one in the latter. In church dialogues it was understood (this not being theatre) that a single character, whether a person or an allegorical figure, could be represented either by a solo voice or by a group of voices (shades here of the origins of Greek tragic drama). In Herr, wende dich the three higher voices are assigned the everyman role of the penitent, their words (accompanied only by the organ continuo) taken from passages in the Psalms and the Book of Job. The bass soloist answers them with words of comfort and is accompanied by the string band. He does not speak the scriptural words of Christ himself, but he is clearly some kind of vox Dei. At first the penitents seem haunted by four words from Job, ‘das Grab ist da’—monosyllables again (‘the grave awaits’), and keep returning to them as the bleakest of refrains. However, encouraged by the bass, they manage at last to lift themselves up and make a direct appeal to God: ‘Neige deine Ohren und erhöre mich!’ (‘Incline thine ear and hear me’). The magic—and the word-setting is musical magic—works, and draws forth a dancing response of unsurpassed warmth and generosity: ‘Ich habe dich erhöret’ (‘I have heard thee’). The penitents have been shown a way to escape the ‘cold oblivion’ of Hell and all the voices and instruments join together in ‘everlasting’ praise: a triple-time chorale introduced by a galliard-like prelude from the strings, based on the head-motif of the coming chorale. With the entry of the voices, ‘Frisch auf, mein Seel’, Bach at last lets the two violinists off the leash to strut their stuff in an exhilarating cosmic dance high above the ensemble. Throughout the seventeenth century many German composers of ‘dialogues’, and Italians before them, had turned to the Song of Songs for suitable (and unsuitable) language with which to dramatise the love-bond between Christ and his faithful, but with Meine Freundin, du bist schön are we in church at all, or have the families and friends rather taken the family Bible out into the fresh air to fête the bridal pair? The piece is certainly written for a marriage, and most likely for the wedding in 1679 of another Johann Christoph, the twin brother of Johann Sebastian’s father Ambrosius. Ambrosius had been a close colleague of his cousin Johann Christoph, our composer, in Eisenach since 1671, and the manuscript of Meine Freundin preserved in the family archive is a fair copy in his hand. Attached to it, and also in Ambrosius’s hand, is an elaborate commentary on the composition (‘Beschreibung dieses Stückes’), complete with references—by means of the letters A to P—to specific passages and moments in the music, perhaps intended to ensure that a playful and ironic purpose underlying the choice of quotations from scripture was not lost on the bride and groom. Briefly, we are to understand, and sympathise with, the difficulties a young couple face in finding a quiet place to enjoy a tryst away from prying eyes. The chosen rendezvous is a garden and the extended ciacona which forms the bulk of the first half of the piece would seem to depict the young woman’s walk to this paradise garden, surrounded by the beauties of nature (depicted in the solo violin-writing) and lost in her own thoughts. Before she can meet up with her beloved, others join her in looking for him (their search is depicted in the bass-line of an instrumental interlude) and the lovers’ union is ultimately celebrated, perforce, in public and surrounded by carousing well-wishers (cue insistent repeated open strings and wild sextuplet divisions—to suggest intoxication?). The party closes with a hymn of thanks, after which, Ambrosius suggests, the newly-weds are at last left to themselves. We get a glimpse in this work of the extended Bach family at play; it was a family tradition to meet up once a year for a musical party and general get-together, and this will have been an opportunity for the young Sebastian to maintain contact with his mentor Johann Christoph, first cousin of the father and uncle he had lost (the other Johann Christoph, the probable young groom, predeceased his twin Ambrosius in 1693). Ambrosius’s commentary closes with fond words of farewell, not included in the work itself, from the departing guests: ‘Gute Nacht! Schlaft wohl! Großen Dank! Macht’s gut! Ihr auch.’ (Goodnight! Sleep well! Many thanks. Take care. You too.) We can only guess at the emotions these phrases, in his father’s handwriting, might have aroused in Johann Sebastian whenever he read them later. Il est difficile de ne pas faire intervenir dans notre appréciation de la musique de Johann Christoph Bach ce que nous savons des trésors que son cadet et petit cousin issu de germain allait sans relâche déverser dans le vaste océan de la musique classique occidentale; et peut-être n’est-ce que justice de reconnaître en lui l’un des affluents les plus profonds venus grossir le grand fleuve qui allait s’écouler de la plume de Johann Sebastian Bach. Non pas que cette revendication fût de celles que Johann Christoph aurait pu formuler pour lui-même, mais plutôt (rétrospectivement) une allégation qu’il nous est aujourd’hui possible de légitimer par notre expérience, interprétation et écoute mêlées, de sa propre musique—telle qu’elle s’offre à nous, avec ses préoccupations, sa manière de procéder et tout ce qui la caractérise. Plus nous gagnons en familiarité avec elle et plus nous avons ce privilège de pouvoir confirmer, en connaissance de cause, l’admiration que lui vouèrent les générations suivantes: «C’était un profond compositeur» (J.S. Bach, 1735). La profondeur n’implique pas nécessairement une complexité démonstrative, même si, s’agissant d’un Bach, on ne saurait être surpris d’apprendre que le vieil homme acariâtre, employé depuis le milieu des années 1660 tant par la ville d’Eisenach pour jouer et veiller sur l’orgue de l’église que par le duc pour tenir le clavecin à sa cour nouvellement établie—il avait une cinquantaine d’années lorsque Sebastian, âgé de dix ans et devenu orphelin, quitta Eisenach pour aller vivre chez son frère à quarante kilomètres de là—, que ce «grand et expressif compositeur», donc, avait la réputation de ne jamais jouer «à moins de cinq parties réelles». Carl Philipp Emanuel, qui relaye l’information, devait la tenir de son père. L’adjonction de parties (strates mélodiques) à une ligne préexistante, pour déployer la texture et définir les contours de l’harmonie, est la base de la tradition polyphonique de la musique occidentale, «le tout» ainsi créé se devant, dans l’idéal, d’être plus grand que la somme des parties elles-mêmes—non seulement la logique et la beauté des lignes individuelles mais les relations entre elles doivent être entendues et prises en considération. L’habileté à improviser à cinq parties réelles, si c’est bien là ce qu’Emanuel Bach entend par «jouer», est de fait une faculté des plus rares, que l’on acquiert au prix d’une extrême assiduité. Dans l’apparente simplicité des deux airs funèbres Mit Weinen hebt sich’s an et Es ist nun aus mit meinem Leben se révèlent diverses formes de complexité subliminale—une sorte d’art caché. Globalement, cette complexité tient au mètre dans l’un, à l’harmonisation dans l’autre. S’agissant de l’adaptation musicale d’un texte, Mit Weinen hebt sich’s an apparaît tel un cours magistral sur la métrique, cette mise en musique passant par l’attention portée à certains choix—phrases du texte qu’il convient de répéter, musique qu’on laisse respirer en fin de phrase ou qui enchaîne sans rupture sur la phrase suivante, par exemple. On y perçoit aussi une manière délibérée de rendre flou et mouvant (par le biais de conflits harmoniques et le recours aux silences) le point qui dans ce sombre poème—dont les trois strophes reflètent respectivement les misères de l’extrême jeunesse, de l’âge mûr et de la vieillesse—devrait s’imposer tel le pivot du schéma rimique. Par les choix auxquels il procède, Bach (il nous faut bien l’appeler ainsi) s’ingénie à répartir l’énoncé de la ligne d’introduction sur treize unités de temps (tactus) puis, parvenu à la fin de chaque strophe et en empilant les élisions tandis que la mélodie prend intensément appui sur une basse descendante, à conduire d’une certaine manière l’auditeur à l’acceptation inconditionnelle d’un (excentrique) quintuple rythme. Es ist nun aus mit meinem Leben, par contre, apparaît telle la simplicité même: régularité absolue des longueurs de phrase, retour fréquent et réutilisation de brèves et délicates phrases mélodiques, bien que sans répétitions de texte (sauf pour la péroraison: «Welt, gute Nacht»), et pourtant, chaque fois qu’il répète une ligne mélodique sur de nouvelles paroles, Bach, harmoniquement, trouve le moyen de la faire aboutir ailleurs, cependant que dans l’ultime répétition de «monde, bonne nuit», il a recours au simple procédé d’une cadence interrompue sous le premier «bonne nuit», qu’il prive ainsi de sa propre finalité, forçant pour ainsi dire la répétition. Dans les deux airs, la séduisante perfection de la route tracée par Bach depuis l’accord initial jusqu’à la cadence de conclusion donne à l’auditeur l’envie de faire à nouveau le voyage—ou la mise en musique d’un poème strophique (le texte complet de Es ist nun aus comprend sept couplets) idéalement réalisée. La lamentation Ach, dass ich Wassers gnug hätte, pour alto, figurait, au côté de ces deux airs, dans l’Altbachisches Archiv, recueil d’œuvres de ses prédécesseurs du clan Bach transmis à C.P.E. Bach par son père. Ayant failli être victime de la Seconde Guerre mondiale (en dépit de l’édition publiée en 1935 pour le 250ème anniversaire de la naissance de J.S. Bach), ce recueil fut par bonheur retrouvé à Kiev en 1999—il a depuis regagné Berlin. Ach, dass ich Wassers gnug hätte a un pendant: la lamentation pour voix de basse Wie bist du denn, o Gott. Ces deux pièces portent le titre de Lamento, toutes deux font appel à une voix unique et à un violon également solo, intensément expressif dans son soutien de l’alto, d’une impressionnante virtuosité contre la basse. Toutes deux ont recours à la riche sonorité d’un ensemble de Violen, dont le soutien est indiqué (dans l’une des sources) comme étant optionnel s’agissant du Lamento pour alto, quand il est à l’évidence essentiel pour celui de la basse. Toutes deux reposent sur des textes bibliques: Jérémie, Psaume 38 et Lamentations pour l’alto; paraphrase métrique de sections des Psaumes de pénitence pour la basse. Toutes deux ont été à l’origine attribuées à d’autres compositeurs: Heinrich Bach (le père de Johann Christoph) dans le cas de Ach, dass ich Wassers gnug hätte, Johann Philipp Krieger pour Wie bist du denn, o Gott, toutes deux ayant été réintégrées de manière convaincante au catalogue de J.C. Bach par la recherche contemporaine. Il serait vain de proposer ici une analyse du Lamento pour alto; disons simplement que, parmi les œuvres de Johann Christoph, celle-ci a fait l’objet d’exécutions réitérées à l’époque moderne. À la fois concentrée et concise, elle produit un effet viscéral et, une fois entendue, s’oublie difficilement. Wie bist du denn est une page à maints égards d’une plus grande portée. Il y a tout d’abord l’impétueuse virtuosité (stylus phantasticus) de l’écriture violonistique, également l’ambitus vocal considérable (plus de deux octaves) imposé au chanteur—les extrêmes y sont atteints sur «die Augen werden Blut und schwellen auf von Weinen» (dans l’aigu de la tessiture) et «so muss ich tief hinab fast in den Abgrund gehen» (au plus profond du registre grave). Mais l’écriture vocale exige aussi agilité et raffinement dans les mélismes et, par-dessus tout, du lyrisme dans l’épanchement faisant suite à «vielleicht ist dir gedient mit Seufzern?», avant le retour aux idées et tournures mélodiques des mesures d’introduction (elles-mêmes préfigurées dans la Sinfonia initiale). Malgré toute sa liberté d’invention quant au détail, l’œuvre impressionne par sa structure: il y a pas moins de quatorze couplets rimés à mettre en musique, les sept premiers se voyant chacun attribuer quelque huit mesures de musique, généralement avec changements de texture et sur des motifs tranchés. À partir du couplet 8, cependant, où le chanteur proclame que jour et nuit il tend ses mains vers Dieu, chaque unité strophique recouvre à peu près deux fois plus de musique que précédemment, le gouffre émotionnel entre la supplication du chanteur et le dédaigneux souci de soi du violon augmentant de manière audible. Tel un contrepoint à cette trajectoire rhétorique s’élargissant, on trouve une série de cadences structurelles qui toujours marquent un retour vers la tonalité de base, jusqu’à la dernière d’entre elles où le violon, en réponse à la supplication «was forderst du für Gaben?» («qu’exiges-tu comme offrandes?»), contraint la musique à suivre sa propre conception d’une tonalité de base à travers un triomphal accord de quatre notes. À partir de là et jusqu’aux ultimes mesures, l’attitude de tous les instruments d’accompagnement, violon compris, semble tendre vers la consolation de cette «Herzensangst» («détresse du cœur») exprimée par le chanteur, cependant qu’à la toute fin répondent aux sixtes descendantes de la voix les sixtes ascendantes du violon, comme suspendues non pas au-dessus de la tonalité de base attendue, mais sa dominante—l’«ardente fureur» transformée en «bonté»? Des deux motets ici retenus, Der Gerechte, ob er gleich zu zeitlich stirbt est conservé dans les archives familiales, tandis que Fürchte dich nicht nous est parvenu par un autre chemin. L’un et l’autre sont à cinq parties (SATTB), avec une différence dans le cas de Fürchte dich nicht. Les motets étaient souvent écrits pour et chantés lors de funérailles, et Der Gerechte met en musique un texte offrant aux proches des défunts, dans le cas d’une mort prématurée, tant la consolation que la réconfortante assurance que le défunt ne saurait être induit en erreur ou tourmenté par la fausseté et la cruauté de la vie. Bach prêche son mini-sermon en manière de madrigal, variant le matériau musical tout du long afin de rehausser et de souligner les concepts fondamentaux, la pointe survenant via la triple répétition finale du mot «bösen». Fürchte dich nicht commence telle une adaptation à quatre parties (ATTB) d’Isaïe, 43, 1: «Ne crains rien, car je t’ai sauvé, je t’ai appelé par ton nom, tu es mien»; dès la mesure 34 le texte a été entièrement et efficacement énoncé, cependant que la musique s’est frayé un chemin de la mineur jusqu’à sol majeur. Bach répète simplement son adaptation des trois derniers mots, «du bist mein», qu’il hausse d’un ton tout en renforçant l’expressivité des accords de neuvième, lesquels se transforment alors en neuvièmes mineures. Lorsque survient la cadence dans la tonalité de base, quelque chose de stupéfiant se produit. Tenue en réserve, une cinquième voix (soprano) entonne alors la mélodie de choral—quelqu’un (Bach lui-même?) a réalisé que la ligne d’introduction de cette sixième strophe de O Traurigkeit, choral funèbre de Johann Rist dont la huitième et dernière strophe s’ouvre sur «O Jesu, du mein Hilf und Ruh», renferme les deux mots clés du verset d’Isaïe: «du [bist] mein» («tu [es] mien»). Bach déconstruit en partie la mélodie de choral et ses paroles, leur conférant de manière saisissante un caractère hésitant et incertain. Les chanteurs des quatre parties initiales («motet») revisitent pendant ce temps l’introduction du texte d’Isaïe jusqu’à ce que Bach soit prêt à introduire la simple imploration «hilf» («aide-moi») au début de la troisième ligne du choral. Les chanteurs trouvent alors une réponse dans les paroles de Jésus au second des larrons crucifiés avec lui: «En vérité, je te le dis: aujourd’hui tu seras avec moi au paradis» (Luc, 23, 43). Les simples monosyllabes d’Isaïe sont réintroduits en guise de refrain, puis telle une coda scellant cette promesse. Fürchte dich nicht reflète déjà certaines techniques, textuelles et compositionnelles, propres à la tradition luthérienne des «dialogues» musicaux tout en continuant de relever, pour l’essentiel, du motet funèbre. Herr, wende dich und sei mir gnädig et Meine Freundin, du bist schön (cette dernière page provenant également du Bach Archiv) portent tous deux dans les sources la dénomination consacrée de Dialogus, l’un et l’autre rendant plus explicite la nature quasi dramatique des dialogues. Tous deux font appel à une formation complète de cordes—avec deux violons à l’écriture virtuose pour le premier et un violon pour le second—ainsi qu’à des solistes vocaux (SATB). Il était admis pour les dialogues d’église (puisque nous ne sommes pas au théâtre) qu’un personnage, être humain ou allégorie, puisse être représenté soit par une voix soliste, soit par un groupe de voix (lointain écho des origines de la tragédie grecque). Dans Herr, wende dich, les trois voix supérieures sont assignées au rôle du chrétien pénitent, leurs paroles (accompagnées par le seul orgue continuo) empruntant aux Psaumes et au Livre de Job. Accompagnée par les pupitres de cordes, la basse soliste leur répond par des paroles de réconfort. Si elle ne prononce pas les paroles bibliques du Christ lui-même, elle n’en apparaît pas moins telle une sorte de vox Dei. De prime abord, les pénitents semblent hantés par quatre mots de Job: «das Grab ist da»—de nouveau des monosyllabes («le tombeau est là»), et continuent de s’y référer tel un refrain des plus lugubres. Pourtant, encouragés par la basse, ils finissent par s’élever et en appeler directement à Dieu: «Neige deine Ohren und erhöre mich!» («Penche tes oreilles et exauce-moi!»). La magie—et l’adaptation est de la magie musicale—fonctionne, de même qu’elle suscite une réponse dansante d’une cordialité et d’une générosité insurpassées: «Ich habe dich erhöret» («Je t’ai exaucé»). Un chemin a été indiqué aux pénitents pour échapper à l’«oubli glacial » de l’enfer et toutes les voix et les instruments s’unissent dans une louange «éternelle»: choral sur mètre ternaire introduit aux cordes par un prélude de type gaillarde, reposant sur le motif de tête du choral qui fait suite. Avec l’entrée des voix, «Frisch auf, mein Seel», Bach laisse finalement les deux violonistes déployer leurs parties en toute liberté via une danse cosmique surplombant l’ensemble. Si tout au long du XVIIe siècle nombre de compositeurs allemands de «dialogues», et avant eux des Italiens, s’étaient tournés vers le Cantique des Cantiques en quête d’un langage approprié (bien que parfois sexuellement connoté) permettant de dramatiser les liens d’amour entre le Christ et ses fidèles, on peut se demander si, avec Meine Freundin, du bist schön, on se trouve véritablement à l’église ou si familles et amis n’ont pas plutôt emporté la Bible familiale au grand air pour y fêter les mariés. La pièce fut de fait composée pour un mariage, très probablement les noces, en 1679, d’un autre Johann Christoph, frère jumeau du père de Johann Sebastian, Ambrosius. Ce dernier avait été, à Eisenach et depuis 1671, un proche collaborateur de son cousin Johann Christoph, notre compositeur, et le manuscrit de Meine Freundin conservé dans les archives familiales est une copie au propre de sa main. L’accompagnant, et également de la main d’Ambrosius, figure un commentaire élaboré de la composition («Beschreibung dieses Stückes»—«Description de cette pièce»), intégralement conservé et complété de références—auxquelles renvoient les lettres A à P—à des passages et sections spécifiques de la musique, l’intention étant peut-être de veiller à ce que le propos enjoué et ironique sous-tendant le choix des citations bibliques n’échappe pas à la jeune mariée et à son fiancé. Pour faire court, nous sommes censés comprendre, tout en compatissant, les difficultés d’un jeune couple à trouver un endroit paisible où goûter un rendez-vous d’amour loin des yeux indiscrets. Le lieu choisi est un jardin, et l’imposante ciacona constituant le corps de la première partie de la pièce semble dépeindre la jeune femme se dirigeant vers le jardin du paradis, entourée des beautés de la nature (restituées à travers l’écriture du violon solo) et comme perdue dans ses propres pensées. Avant même de pouvoir rencontrer son fiancé, d’autres se joignent à elle pour le chercher (quête elle-même dépeinte par la partie de basse d’un interlude instrumental), l’union des promis étant finalement célébrée, par la force des choses, en public et parmi la foule d’admirateurs faisant la fête (comme le suggèrent d’insistantes cordes à vide réitérées et d’extravagantes diminutions en sextolets—pour suggérer l’ivresse?). La noce se referme sur une hymne d’action de grâces au terme de laquelle, ainsi qu’Ambrosius le suggère, les nouveaux mariés sont enfin laissés à eux-mêmes. Cette œuvre nous offre un instantané de la famille Bach «en grande formation»: l’une des traditions familiales voulait que l’on se retrouve une fois l’an pour une grande fête musicale où toute la parentèle était réunie—ce genre d’occasion aura permis au jeune Sebastian de maintenir le contact avec son mentor Johann Christoph, cousin germain du père et de l’oncle qu’il avait perdus (l’autre Johann Christoph, sans doute le jeune marié, étant décédé, en 1693, deux ans avant son jumeau Ambrosius). Le commentaire d’Ambrosius conclut sur d’affectueux mots d’adieu—qui ne figurent pas dans l’œuvre proprement dite—prononcés par les convives sur le départ: «Gute Nacht! Schlaft wohl! Großen Dank! Macht’s gut ! Ihr auch.» («Bonne nuit! Dormez bien! Grand merci! Portez-vous bien! Vous aussi.») On imagine l’émotion ressentie par Johann Sebastian lorsque, plus tard, il vint à lire ces quelques phrases notées de la main de son père. Wenn wir die Musik von Johann Christoph Bach kennen und schätzen lernen, dürfte es nicht ausbleiben, dass wir uns auch der Reichtümer bewusst werden, die sein jüngerer Großcousin in den weiten Ozean der westlichen klassischen Musik fließen lassen würde; und vielleicht erweisen wir Johann Christoph keinen schlechten Dienst, wenn wir seinen Anspruch anerkennen, als einer der tiefsten Nebenflüsse des großen Stroms der Musik zu gelten, der mit dem Namen Johann Sebastian Bachs verbunden ist. Nicht dass dies eine Forderung gewesen wäre, die Johann Christoph für sich selbst erhoben hätte; es ist vielmehr eine Bewertung, die wir heute (von unserem Ende der Zeitachse aus) durch die Erfahrung erhärten können, die wir durch die Aufführungen und das Hören seiner Musik gewonnen haben—ihrer Inhalte, ihrer Vorgehensweise, ihrer einzelnen Elemente. Wenn wir mit ihr vertrauter werden, wird uns das Privileg zuteil, auf der Basis dieses Wissens die Bewunderung zu teilen, die ihm nachfolgende Bach-Generationen entgegenbrachten: „Er war ein profunder Komponist“ (J. S. Bach, 1735). Profundität beinhaltet nicht notwendigerweise eine sofort ins Auge fallende Komplexität. Allerdings sollten wir im Fall eines Bachs nicht überrascht sein, wenn wir erfahren: Der mürrische alte Mann, der seit Mitte der 1660er Jahre im Dienst der Stadt Eisenach in der Kirche die Orgel spielte und instandhielt, daneben am neu errichteten Hof des Herzogs als Cembalist tätig war, ein Mann in den Fünfzigern, als der zehnjährige Johann Sebastian, Vollwaise geworden, von Eisenach fünfundvierzig Kilometer weiter zu seinem Bruder zog—„dieser große und ausdrückende Componist“ stand im Ruf, er habe „niemals mit weniger als fünf nothwendigen Stimmen gespielt“. Carl Philipp Emanuel, der diese Information liefert, dürfte sie von seinem Vater gehabt haben. Das Hinzufügen weiterer Stimmen (Melodieebenen) zu einer vorhandenen Linie mit dem Ziel, ein Geflecht zu schaffen und die Konturen der Harmonie zu bestimmen, gehört zu den Grundlagen der polyphonen Tradition in der westlichen Musik, und im Idealfall sollte das auf diese Weise erreichte „Ganze‰ größer sein als die Summe der einzelnen Teile—nicht nur im Hinblick auf die Logik und Schönheit der einzelnen Linien, auch die Beziehungen zwischen ihnen müssen gehört und eingeschätzt werden können. Die Fähigkeit, mit „fünf nothwendigen Stimmen“ zu improvisieren, wenn es das ist, was Carl Philipp Emanuel Bach mit „spielen“ meinte, ist in der Tat eine sehr seltene Fertigkeit, die sich nur mit ungeheurem Fleiß erwerben lässt. Unter der vordergründigen Schlichtheit der beiden Lamenti Mit Weinen hebt sich’s an und Es ist nun aus mit meinem Leben ist ein komplexes System vorhanden—Kunst im Ver borge nen. Grob gesagt sind es Vertracktheiten des Metrums in der einen Arie, der Harmonisierung in der anderen. Mit Weinen hebt sich’s an könnte als Muster beispiel für eine metrische Wortvertonung gelten, die durch eine sorgfältige Auswahl der zu wiederholenden Textteile und die Entscheidung erreicht wird, ob die Musik am Ende der Phrase pausieren darf oder der Text weitergeführt werden muss. Auch absichtlich eingesetzte Unschärfen und Verschiebungen (durch harmonische Stasis und die Verwendung von Pausen) des offenkundigen Angel punkts sind im Reimschema des düsteren, dreistrophigen Gedichts vorhanden, in denen die jammervollen Jahre des Menschen in der Kindheit, in der Lebensmitte und im Alter nachgezeichnet werden. Durch die Entscheidungen, die er trifft, gelingt es Bach (wir müssen ihn so nennen), die Aussage der Anfangszeile über dreizehn Zeiteinheiten (oder tactus) zu strecken, und am Ende jeder Strophe hat er durch die wachsende Zahl der Auslassungen, während sich die Melodie gegen einen fallenden Bass emporarbeitet, den Hörer so weit gebracht, dass dieser den (absonderlichen) Fünfertakt bedingungslos akzeptiert. Es ist nun aus mit meinem Leben hingegen scheint ein Musterbeispiel für Schlichtheit zu sein: absolute Regelmäßigkeit der Phrasenlängen, kurze und sanfte melodische Phrasen, die oft wiederkehren und noch einmal verwendet werden, allerdings ohne Wiederholung des Textes (mit Ausnahme des Abschiedsgrußes am Schluss: „Welt, gute Nacht“). Doch jedes Mal, wenn Bach eine Melodielinie mit neuem Text unterlegt, versteht er es, sie harmonisch in eine andere Richtung zu lenken, und bei der letzten Wiederholung von „Welt, gute Nacht“ nutzt er den einfachen Kunstgriff einer unterbrochenen Kadenz unter dem ersten „gute Nacht“, nimmt dem Gruß seine Endgültigkeit und erzwingt gewissermaßen die Wiederholung. In beiden Arien erweckt die faszinierende Perfektion der Wegstrecke, wie sie Bach vom ersten Akkord bis zur abschließenden Kadenz angelegt hat, im Hörer die Sehnsucht, den Weg erneut zurückzulegen—ein ideales Ergebnis der Vertonung strophischer Gedichte (der vollständige Text von „Es ist nun aus“ umfasst sieben Strophen). Das Lamento für Altstimme Ach, dass ich Wassers gnug hätte ist, zusammen mit den beiden Arien, im Altbachischen Archiv enthalten, der Sammlung von Werken älterer Mitglieder der Bach-Familie, die Carl Philipp Emanuel von seinem Vater erbte. Diese Sammlung wäre beinahe dem Zweiten Weltkrieg zum Opfer gefallen (allerdings war eine nicht sehr anspruchsvolle Ausgabe 1935 anlässlich des 250. Geburtstags Johann Sebastian Bachs veröffentlicht worden), wurde jedoch dank glücklicher Umstände 1999 in Kiew wiederentdeckt und befindet sich nun wieder in Berlin. Ach, dass ich Wassers gnug hätte hat ein Pendant in dem Lamento für Bass Wie bist du denn, o Gott. Beide tragen den Titel Lamento, beide sind für Solostimme geschrieben, beide enthalten eine Solovioline, die der Altstimme eine sehr aus drucksvolle Stütze bietet und beeindruckend virtuos gegen den Bass gesetzt ist. Beide nützen die Klangfülle einer unterstützenden Gruppe aus Violen, die in dem Lamento für Alt (in einer Quelle) als fakultativ bezeichnet werden, im Lamento für Bass jedoch unverzichtbar sind. Beide basieren auf biblischen Texten: den Klageliedern Jeremias und Psalm 38 beim Lamento für Alt, einer metrischen Paraphrase von Auszügen aus den Bußpsalmen bei dem Stück für Bass. Beide waren zuvor anderen Komponisten zugeschrieben worden—Ach, dass ich Wassers g’nug hätte Heinrich Bach (Johann Christophs Vater), und Wie bist du denn, o Gott Johann Philipp Krieger—, wurden von der modernen Forschung jedoch überzeugend als Werke Johann Christophs bestätigt. Es wäre müßig, hier eine Analyse des Alt-Lamentos zu bieten; es ist immerhin eines der Werke Johann Christophs, die in der Moderne außer ordentlich häufig aufgeführt werden. Es ist konzentriert, prägnant und geht zu Herzen, es ist kaum zu vergessen, wenn man es einmal gehört hat. Wie bist du denn ist in vielerlei Hinsicht breiter gefächert. Zunächst einmal verblüfft die feurige Virtuosität (stylus phantasticus) des Violinsatzes, dann der vom Sänger geforderte immense Stimmumfang (über zwei Oktaven)—erreicht werden die Extreme bei den Worten „die Augen werden Blut und schwellen auf von Weinen“ (so hoch, dass sie tatsächlich die Tränen in die Augen treiben) und „so muss ich tief hinab fast in den Abgrund gehen“ (fünf Faden tief, wie jenes Grab in Shakespeares Sturm). Doch der Vokalsatz verlangt auch Agilität und Finesse bei den Melismen, und vor allem Lyrik in den abschließenden Reuebekundungen, die auf die Frage „vielleicht ist dir gedient mit Seufzern?“ folgen und der Rückkehr zu den Gedanken und melodischen Gesten der Anfangstakte vorausgehen (auf die wiederum schon in der einleitenden Sinfonia verwiesen wurde). Bei aller freien Erfindung in den Details hat das Werk eine eindrucksvolle Struktur: Vierzehn Reimpaare sind zu vertonen, und den ersten sieben werden mehr oder weniger acht Takte Musik zugeteilt, zumeist mit deutlichen Veränderungen der Textur und Motive. Vom achten Reimpaar an, wo der Sänger sagt, er strecke Tag und Nacht zu Gott die Hände aus, wird jede Verseinheit gedehnt und erhält musikalisch ungefähr doppelt so viel Raum wie zuvor, und hörbar erweitert wird die emotionale Kluft zwischen dem Flehen des Sängers und der verächtlichen Selbstgefälligkeit der Violine. Als Gegengewicht zu diesem expandierenden Rhetorik sind eine Reihe formgebender Kadenzen vorhanden, die stets eine Rückkehr zur Grundtonart markieren, bis hin zur letzten, in der die Violine, als Antwort auf die flehentliche Frage „was forderst du für Gaben?“, mit einem vierstimmi gen Akkord der Musik in ihre eigene Vorstellung von einer Grundtonart aufzwingt. Von dieser Stelle an bis zu den Schlusstakten scheinen alle Gesten der begleitenden Instrumente, einschließlich der Violine, darauf angelegt zu sein, die „Herzensangst“ des Sängers zu beschwichtigen, und zum Schluss antworten auf die fallenden Sexten der Stimme die aufsteigenden Sexten der Violine, jedoch als Vorhalte, nicht über der erwarteten Grundtonart, sondern ihrer Dominante—„Eifer in Güte umgewandt“? Von den beiden hier vorgestellten Motetten ist Der Gerechte, ob er gleich zu zeitlich stirbt im Bach’schen Familienarchiv erhalten, während Fürchte dich nicht auf anderem Weg überliefert wurde. Beide Stücke sind für fünf Stimmen geschrieben (SATTB), mit Ausnahme von Fürchte dich nicht betrifft. Motetten wurden oft zur Aufführung bei Trauergottesdiensten komponiert, und Der Gerechte vertont einen Text, der den Trauernden neben Trost auch die verheißungsvolle Versicherung bietet, dass der Verstorbene nun nicht mehr durch die Falschheit des „bösen Lebens“ in irregeleitet werden könne. Bach trägt die Miniaturpredigt auf madrigalische Manier vor, variiert ständig das musikalische Material, um die wesentlichen Kernpunkte hervorzuheben und in der abschließenden dreimaligen Wiederholung von „bösen“ die Pointe zu liefern. Fürchte dich nicht beginnt als Vertonung für vier Stimmen (ATTB) von Jesaja 43, 1: „Fürchte dich nicht, denn ich habe dich erlöst, ich habe dich bei deinem Namen gerufen, du bist mein“, und mit dem vier unddreißigsten Takt ist der Text vollständig und aus drucksvoll vorgetragen, während die Musik unter dessen ihren Weg von a-Moll hinunter zu G-Dur genommen hat. Bach wiederholt nun einfach seine Vertonung der letzten drei Wörter, „du bist mein“, einen Ton höher und steigert die Ausdruckskraft der Nonenakkorde, aus denen jetzt verminderte Nonen werden. Doch sobald die Kadenz in der Grundtonart erreicht ist, ereignet sich etwas Atemberaubendes. Eine fünfte (Sopran-) Stimme wartet auf ihren Auftritt—und jemand (Bach selbst?) hat bemerkt, dass der sechste Vers von O Traurigkeit, eines Trauerchorals von Johann Rist, dessen Text „O Jesu, du mein Hilf und Ruh“ lautet, die zwei Schlüsselwörter der schlichten Feststellung Jesajas enthält: „du [bist] mein“. Bach zerlegt die Choralmelodie und ihren Text und gibt ihnen durch eine Verzögerung von atemberaubender Spannung etwas Ungewisses. Die Sänger der „Motette“ wenden sich unterdessen dem Anfang des Jesaja-Textes zu, bis Bach bereit ist, die schlichte Bitte „hilf“ zu liefern, mit der die dritte Zeile des Chorals beginnt. Die übrigen Sänger finden eine Antwort bei den Worten, die Jesus zum zweiten der mit ihm gekreuzigten Diebe sprach: „Wahrlich, ich sage dir: Heute wirst du mit mir im Paradies sein“ (Lukas 23, 43). Jesajas schlichte Einsilber kehren als Refrain wieder, dann als Coda, in der dieses Versprechen besiegelt wird. Fürchte dich nicht, im Kern eine Trauermotette, weist bereits einige der—textlichen wie auch kompositorischen—Techniken der lutherischen Tradition des musikalischen „Dialogs“ auf. Herr, wende dich und sei mir gnädig und Meine Freundin, du bist schön (letztere aus dem Bach’schen Archiv) tragen beide in den Quellen den offiziellen Titel Dialogus, und beide heben den pseudodramatischen Charakter von Dialogen ausdrücklich hervor. Beide sind für ein vollständiges Streicherensemble sowie Solisten (SATB) bestimmt und enthalten einen virtuosen Violinsatz für zwei Violinen im ersten, für eine Violine im zweiten Stück. In Dialogen für die Kirche (die ja kein Theater war) galt als selbstverständlich, dass eine Rolle, gleichgültig ob Mensch oder allegorische Figur, entweder von einer Solostimme oder einer Gruppe von Stimmen (Anklänge hier an die Ursprünge der griechischen Tragödie) gesungen werden konnte. In Herr, wende dich wird die Jedermann-Rolle des reuigen Sünders von den drei oberen Stimmen übernommen, der Text (nur vom Orgelcontinuo begleitet) besteht aus Abschnitten aus den Psalmen und dem Buch Hiob. Der Bassist antwortet ihnen mit trostreichen Worten, vom Streicherensemble begleitet. Er spricht nicht die biblischen Worte Christi, ist aber er auf jeden Fall eine göttliche Stimme. Anfangs scheinen die Sünder durch die vier Worte aus Hiob, „das Grab ist da“ (wieder Einsilber), verstört zu sein und wiederholen sie in einem Refrain, wie er trostloser nicht sein kann. Doch schließlich gelingt ihnen, vom Bass bestärkt, Mut zu fassen und sich direkt an Gott zu wenden: „Neige deine Ohren und erhöre mich!“ Das Wunder—und die Vertonung des Textes ist ein musikalisches Wunder—geschieht und bringt eine tänzerische Antwort von unübertroffener Wärme und Hochherzigkeit hervor: „Ich habe dich erhöret“. Den Sündern wurde ein Weg gezeigt, dem „kalten Vergessen“ der Hölle zu entkommen, und alle Stimmen und Instrumente vereinen sich in „ewig währendem“ Preis: ein Choral im Dreiertakt, eingeleitet von einem gaillardeartigen Präludium der Streicher, das auf dem Kopfmotiv des sich anschließenden Chorals basiert. Mit dem Einsatz der Stimmen, „Frisch auf, mein Seel“, lässt Bach endlich zwei Violinen von der Leine, die nun Gelegenheit erhalten, ihre Sache hoch über dem Ensemble in einem beglückenden kosmischen Tanz vorzutragen. Das ganze 17. Jahrhundert hindurch fanden viele deutsche—und vor ihnen italienische—Komponisten im Hohelied Salomos die geeignete (oder ungeeignete) Sprache, um das Band der Liebe zwischen Christus und seinen Gläubigen dramatisch zu gestalten. Doch sind wir mit Meine Freundin, du bist schön überhaupt in der Kirche, oder haben eher Familie und Freunde die Familienbibel hinaus in die frische Luft getragen, um das Brautpaar zu feiern? Das Stück wurde mit Sicherheit für eine Trauung geschrieben, sehr wahrscheinlich für die Eheschließung 1679 eines anderen Johann Christoph, des Zwillingsbruders von Johann Sebastians Vater Johann Ambrosius. Ambrosius war in Eisenach seit 1671 ein enger Kollege seines Vetters Johann Christoph, unseres Komponisten, und das im Bach’schen Familienarchiv erhaltene Manuskript von Meine Freundin ist eine Reinschrift aus seiner Hand. Als Anhang zu der Komposition ist, ebenfalls in Ambrosius’ Handschrift, eine ausführliche „Beschreibung dieses Stückes“ vorhanden, um Verweise auf bestimmte Stellen in der Musik—mit den Buchstaben A bis P—ergänzt, vielleicht weil er sichergehen wollte, dass Braut und Bräutigam den scherzhaften und ironischen Hintersinn, der seiner Auswahl von Zitaten aus der Bibel zugrunde lag, auch wirklich verstanden. Kurz gesagt, wir sollen begreifen, wie schwierig es für ein junges Paar ist, einen ruhigen Ort zu finden, an dem sie ungestört allein sein können, und die Bedrängnis der jungen Leute nachempfinden. Der für das Stelldichein vorgesehene Ort ist ein Garten, und die ausgedehnte Ciacona, die den über wiegenden Teil der ersten Hälfte des Stückes ausmacht, scheint zu beschreiben, wie die junge Frau den Weg zu diesem Paradiesgarten zurücklegt, umgeben von den Schönheiten der Natur (von der Solovioline wiedergegeben) und in ihre Gedanken vertieft. Bevor sie ihren Auserwählten treffen kann, gesellen sich Bekannte zu ihr, die ihr bei der Suche helfen wollen (die Basslinie schildert die Suche in einem instrumentalen Zwischenspiel), und die Begegnung der Liebenden wird schließlich—notgedrungen—öffentlich gefeiert, umgeben von zechenden Gratulanten (Einsatz beharrlich wiederholter offener Saiten und wilde Sextolen—die den berauschten Zustand der Gäste darstellen?). Die Feier schließt mit einem Dankgesang, und Ambrosius drängt darauf, das junge Paar endlich allein zu lassen. Wir gewinnen in diesem Werk einen Einblick in die Gepflogenheiten der großen Bach-Familie; zur Familientradition gehörte es, sich einmal im Jahr zu einem allgemeinen und musikalischen Beisammensein zu treffen, und dies dürfte für den jungen Johann Sebastian eine Gelegenheit gewesen sein, mit seinem Mentor Johann Christoph, dem Cousin seines Vaters und Onkels (der andere Johann Christoph, vermutlich der junge Bräutigam, der 1693 vor seinem Zwillingsbruder Ambrosius verstarb), Kontakt zu erhalten. Ambrosius’ Kommentar schließt mit herzlichen Abschiedsworten, im Werk selbst nicht enthalten, an die scheidenden Gäste: „Gute Nacht! Schlaft wohl! Großen Dank! Macht’s gut! Ihr auch“. Wir können nur vermuten, was Johann Sebastian empfand, wenn er diese Worte in der Handschrift seines Vaters las.